The Zope framework has several fundamental underlying concepts, each of which should be understood in order to make the most of your Zope experience. Zope relieves the developer of most of the onerous details of Web application development, such as data persistence, data integrity, and access control, allowing one to focus instead on the problem at hand. It allows you to utilize the services it provides to build web applications more quickly than other languages or frameworks, and to write web application logic in the Python language. Zope also comes with one solution that allow you to “template” text, XML, and HTML: Zope Page Templates (ZPT). Unlike common, file-based web template systems, such as ASP or PHP, Zope is a highly “object-oriented” web development platform. Object orientation is a concept that is shared between many different programming languages, including Python. The concept of object orientation may take a little “getting-used-to” if you’re an old hand at procedural languages used for web scripting, such as Perl or PHP. However, you will easily grasp its main concepts by reading the Object Orientation chapter, and by trying the hands-on examples in this book. The technology that would become Zope was founded on the realization that the Web is fundamentally object-oriented. A URL to a Web resource is really just a path to an object in a set of containers, and the HTTP protocol provides a way to send messages to that object and to request a response. Zope’s object structure is hierarchical, which means that a typical Zope site is composed of objects that contain other objects (which may contain other objects, ad infinitum). URLs map naturally to objects in the hierarchical Zope environment based on their names. For example, the URL “/Marketing/index.html” could be used to access the Document object named “index.html” located in the Folder object named “Marketing”. Your web browser sends a request to the Zope server. The request specifies a URL in the form ‘protocol://host:port/path?querystring”’, e.g., ‘http://www.zope.org:8080/Resources?batch_start=100’. Zope separates the URL into its component “host”, “port” “path” and “query string” portions (‘http://www.zope.org’, ‘8080’, ‘/Resources’ and ‘?batch_start=100’, respectively). Zope locates the object in its object database corresponding to the “path” (‘/Resources’). Zope “executes” the object using the “query string” as a source of parameters that can modify the behavior of the object. This means that the object may behave differently depending on the values passed in the query string. If the act of executing the object returns a value, the value is sent back to your browser. Typically a given Zope object returns HTML, file data, or image data. The data is interpreted by the browser and shown to you. Mapping URLs to objects isn’t a new idea. Web servers like Apache and Microsoft’s IIS do the same thing: they translate URLs into files and directories on a file system. Zope similarly maps URLs to objects in its object database. A Zope object’s URL is based on its path, which is composed of the ‘ids’ of its containing Folders and the object’s ‘id’, separated by slash characters. For example, if you have a Zope “Folder” object in the root folder called Bob, then its path would be ‘/Bob’. If Bob is in a sub-folder called Uncles, then its URL would be ‘/Uncles/Bob’. The URL of an object is most simply composed of its ‘host’, ‘port’, and ‘path’. For the Zope object with the path ‘/Bob’ on the Zope server at http://localhost:8080/, the URL would be http://localhost:8080/Bob. Visting a URL of a Zope object directly is termed calling the object through the web. This causes the object to be evaluated and the result of the evaluation to be returned to your web browser. For a more detailed explanation of how Zope performs object publishing, see the Object Publishing chapter of the Zope Developer’s Guide. To create and work with Zope objects, you can use your Web browser to access the Zope management interface (ZMI). Basic management and application configuration tasks can be done completely through the Web using only a browser. The ZMI provides a familiar, Windows Explorer-like view of the Zope object system. Any object in the object hierarchy can be configured. Site managers can work with their objects by clicking on tabs that represent different “views” of an object. These views vary depending on the type of object. For example a “Database Connection” Zope object provides views that let you modify its connection string or caching parameters. All objects also have a “Security” view that allows you to manage their individual access control settings. Zope had a much larger focus on Through-The-Web activities in its beginning. In recent years the Through-The-Web model has been discouraged for any kind of development and reduced to configuration tasks. One of the things that sets Zope apart from other application servers, is that it was designed from the start to be tightly coupled with not only the Web object model, but also the Web development model. Today’s successful web applications require the participation of many people across an organization with different areas of expertise. Zope is specifically designed to accommodate this model, allowing site managers to safely delegate control to design experts, database experts, and content managers. A successful Web site requires the collaboration of many people people in an organization: application developers, SQL experts, content managers, and often even the end users of the application. On a conventional Web site, maintenance and security can quickly become problematic: how much control do you give to the content manager? How does giving the content manager a user account affect your security? What about that SQL code embedded in the ASP files he’ll be working on – code that probably exposes your database login? Objects in Zope provide a robust set of possible permissions, richer than that of a conventional file-based system. Permissions vary by object type, based on the capabilities of that object, which enables the implementation of fine-grained access control. For example, you can set access control so that content managers can use “SQL Method” objects without being able to change them or even view their source. You can also set restrictions so that a user can only create certain kinds of objects, for instance, “Folders” and “Page Templates,” but not “SQL Methods” or other objects. Zope provides the capability to manage users through the web via User Folders, which are special folders that contain user information. Several Zope add-ons are available that provide extended types of User Folders that get their user data from external sources, such as relational databases or LDAP directories. The ability to add new User Folders can be delegated to users within a sub-folder, essentially allowing you to delegate the creation and user management of subsections of your website to semi-trusted users, without having to worry about those users changing the objects “above” their own folder. By default, Zope objects are stored in a high-performance, transactional object database known as the Zope Object Database (ZODB). Each web request is treated as a separate transaction by the ZODB. If an error occurs in your application during a request, any changes made during the request will be automatically rolled back. The ZODB also provides multi-level undo, allowing a site manager to “undo” changes to the site with the click of a button. The Zope framework makes all of the details of persistence and transactions totally transparent to the application developer. Relational databases, when used with Zope, can also play in Zope’s transactional framework. Zope objects are contained inside other objects (such as Folders). Objects can “acquire” attributes and behavior from their containers. The concept of acquisition works with all Zope objects and provides an extremely powerful way to centralize common resources. A commonly-used SQL query or snippet of HTML, for example, can be defined in one Folder, and objects in sub-folders can use it through acquisition. If the query needs to be changed, you can change it in one place without worrying about all of the sub-objects that use the same query. If you are familiar with Cascading Style Sheets (CSS), you already know how an element in an HTML document can inherit cascading properties from its parent or ancestor elements. Containment acquisition works in the same fashion: if a document X is contained in folder Y, document X can access the attributes of folder Y through acquisition. Note that some advanced aspects of acquisition may break this analogy; these are discussed in the Advanced Zope Scripting chapter. Acquisition is explained in further detail in the chapter on Acquisition . Zope is highly extensible, and component developers can create new types of Zope objects by writing new Zope add-on in Python. The Zope software provides a number of useful, built-in components to aid extension authors in development, including a robust set of framework classes that take care of most of the details of implementing new Zope objects. A number of Zope add-ons are available that provide features like drop-in web discussion topics, desktop data publishing, XML tools, and e-commerce integration. Many of these add-ons have been written by highly active members of the Zope community, and most are also open source. Zope comes with a built-in web server that serves content to you and your users. This web server also serves Zope content via FTP, WebDAV, and XML-RPC (a remote procedure call facility). Of course, you may already have an existing web server, such as Apache or Microsoft IIS, and you may not want to use Zope’s web server. Zope works with these servers also, and any other web server that supports the Common Gateway Interface (CGI). In production environments, it can be advantageous to run a server like Apache or Squid “in front of” Zope in order to help sanitize incoming requests, augment its capabilities (e.g., terminate HTTPS connections), and cache Zope-provided content. This is the engine that coordinates Zope activity, driving its management interface and object database. When you work with Zope, you are usually working with objects that are stored in the ZODB. You don’t have to store your information in Zope’s object database if you don’t want to. 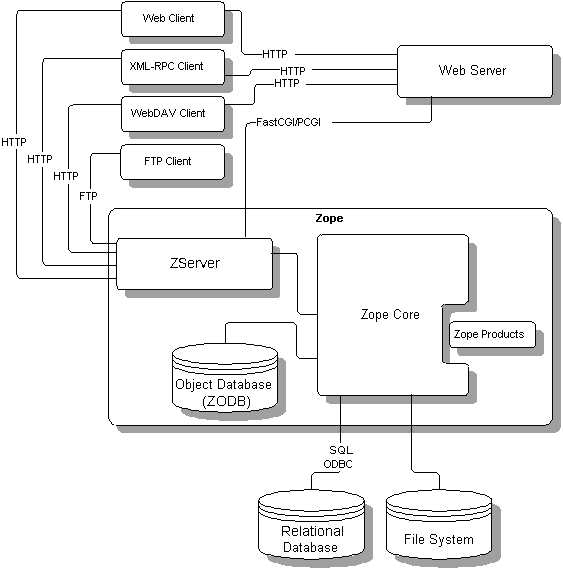 Zope also works with other relational databases, including Oracle, PostgreSQL, Sybase, and MySQL. Zope can, of course, work with documents and other files stored on your server’s file system. Zope also allows site managers to add new, pre-built object types to Zope by installing add-ons on the Zope server file system. These are referred to as Products or Add-ons. Technically they are normal Python packages.